What is a “Postej” or “pye”? I use the Danish word postej to describe this dish but in the English medieval literature they are tend to be called “pye”. What we today would call a pie. Sometimes they are also called a Pâté. A postej is meat, fish or fruit dish that is inside a container of dough, what in the English medieval kitchen would be called a “coffin” of dough. It was baked in the oven or in a postej-oven which is pretty much a Dutch oven. The dough can be edible or inedible as you please. The postejs I have baked so fare are baked with an edible dough – because anything else seems wasteful to me. 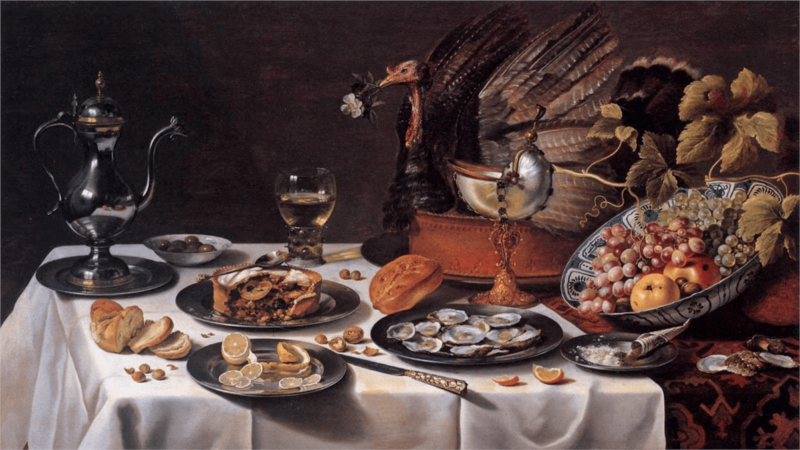 “Still Life With A Turkey Pie” by Pieter Claesz, 1627. Notice that there are two postejs in the picture – a grand one with real turkey feathers and a head and a simpler one broken open. Postejs can be grand affairs with elaborate decorations or just a simple crust around a piece of meat. The interesting thing is that they can hold anything from whole pieces of meat, whole birds with bones or minced meat or sweet fillings that makes them almost a fruit pie. As fare as I can tell from the recipes they are made without air holes – until they are almost baked though. 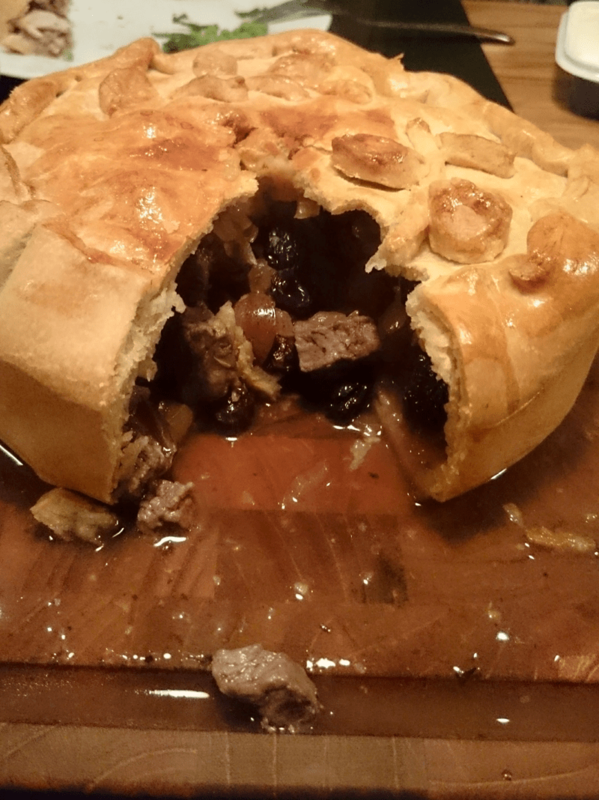 Unlike many modern pies the casing/crust are normally not pre-baked. The filling however is often cooked or semi cooked before the postej is assembled. The crazy creations of the barok era would be made by specialized postej bakers in their own workshops and you would order them for your feast. They seem to have been common upper class dishes though out Europe in the middle ages and at least in Northern Europe they were very popular in the renaissance. In Denmark they were part of the bourgeoisie cuisine up though the 1800’s – in the early 1900’s they were abandoned when they were deemed too heavy and old fashioned. My game postej with grapes and raisins. The filling can be really simple – just wrap a game leg in crust and bake it for an hour – or they can be really complex like the filling in the picture above that seems to be full of all kinds of fruits. You would not slice the pie in neat pieces but rather break it own and eat the filling out of it. If you choose to do something like that there is no need to do a complex and edible crust – you can just make one from boiling water and coarse flour (which I have not tried yet. If you want to try to make one your self you can either just bake one under a shortcrust or puff pastry lid in an ovenproof dish – just make sure to glue the edges of the crust shut with a bit of egg. Or you can make it in a cake tin with a loose bottom and use either all short crust or use my postej dough for the sides of the pie. You will want to use a better pastry fro the lid though – such as puff pastry or short crust as it is more likely to get eaten by your guests. Read much more about postejs in “Historisk Kogebog. Kogekunst i Danmark 1616-1910” by Else-Marie Boyhus. After looking at all these art works I can see that I shape my postejs wrong – the edges should be turned up rather than over. Ok something to fix for next time. “Still Life with Pâté” by Eugene Boudin 19th century. This one is baked in a postej tin made of sheet metal – which gives the pretty shape. Sebastian Stoskopff (1597 –1657). A simpler postej with some kind of meat inside. Section of the painting Still Life With Musical Instruments” by Pieter Claesz, 1623. It looks like the postej is filled with fruit – among those an orange of some kind. “Still Life With Musical Instruments” by Pieter Claesz, 1623. It looks like the postej is filled with fruit – among those an orange of some kind. 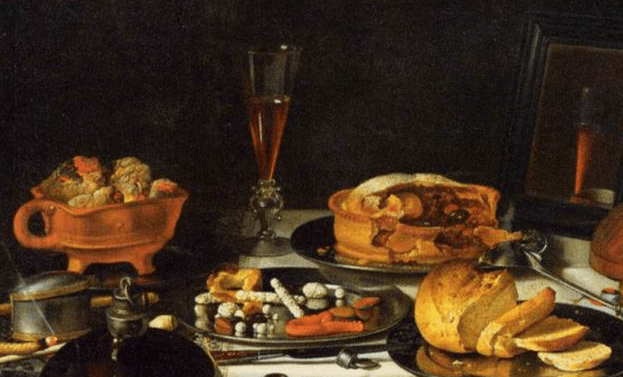 Detail from the painting “Still Life with a Turkey Pie”, Pieter Claesz., 1627. Here we have some kind of fruit pie with what looks like blackberries. Detail of the postej. This is the flatest I have seen yet. I wonder what is in it. A street merchant selling postejs to a munk. I couldn’t find the source sadly.